I would think that having steering while driving down the road at speed might be of somewhat importance to you and your family? Not saying the other stuff is junk by any means. Are hydraulic steering systems street legal? Either way, I love this X!!! Technically...no. Most laws say you must have some sort of mechanical linkage. Would most people know the differance...probably not. The VX is back at the shop right now, but this guy has been building buggies for over 20 years now, so he gets first crack at fixing the problem (besides I found some math errors and double charges, so I've got some cushion money factored in). I had mentioned the hydraulic steering before because the steering box had such a small pitman arm, not enough on the turning radius. Longer arms would run into other components. Rockkrawler makes a hydraulic unit that looked pretty good and cheaper than PSC setups. I will keep all these comments in my wallet for the next time I go out to visit the monster! "First thing, the pin that connects the transfer case lever to the shaft fell out literally in my drive way. Second, the transmission was way overfilled and was shifting erractically not to mention dripping everywhere. but the main reason had to do with the HORRIBLE steering. Truly, I could barely keep it in my lane up to ~40mph, above that, I needed some extra room to allow for lane wandering. I couldn't find any play in the system, so probably extreme bump steer." I simply ask that you ask your builder why (with all his experience) he has made decisions that work against your overall goal. With all the evidence of poor engineering I have seen I think you should approach him with a barrage of questions to protect yourself from being scammed/taken advantage of. 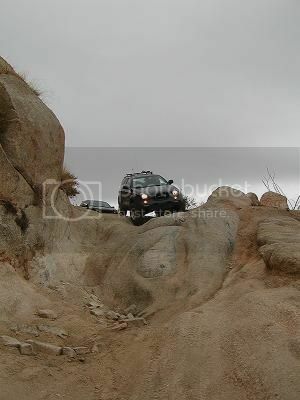 1) The stock lower rear links on the VX are known to be weak when controlling something as small as a 33" tire offroad. You have much more tire and therefore leverage than that here... Your links have been cut, perhaps sleeved (let's hope at least), and then welded together. Bottom line, they are weak, sloppy, not enough, and could be dangerous for you and your family. 2) The rear track bar. We can't see from the pics, has that track bar been lengthened or lowered, and if so, how was it done? You may have 6"-9" of lift on your VX and as such if the track bar was not lengthened or lowered, the driver side tire should be sticking out 1"+ more than the passenger tire. Notice the track bar is tied to the driver side frame rail... I'll get back to this. 3) The upper rear suspenion link. How was this one extended? Let's hope it was cut in the middle and then sleeved throughtout it's length at least. It does not see the abuse the lower arms do but it should still be modified correctly or, ideally, replaced. 4) Based off a pic I saw of beefy links sitting on the floor I am thinking builder guy assembled a 3-link in the front with a track bar, resembling the rear suspension. Since there is only one pic of the arms installed, I have to say, they are very short and at an extreme angle if they are indeed shown at ride height. If that is the case, it will always handle and ride like crap and is dangerous! When drooping (like during even a mild jump), the axle will move back so far you run the risk of breakage and a harsh absorption. When flexing, you will see EXTREME axle steer where the drooping side will move backward and the compressing side will move forward causing the VX to turn and steering input may not compensate, especially with the front locker engaged! 5) Did builder guy install cross-over steering? If he did not then your front track bar is installed backward!!!!! Look at it, the track bar needs to be INLINE with the drag link! If it is not then as the suspension droops the distance between the axle mounted end of the track bar and the passenger steering knuckle lessens... what this means is for every bump you hit the axle is shoved to the left and your steering wheel to the right! 6) Because of the short wheelbase of a VX, your new high center of gravity, your steep front control arms, the opposing draglink and track arm scenario in conjunction with the opposing rear track arm at an increased angle, when you hit a nice size pot hole or bump at speed the VX will scissor dangerously. The front axle will dodge to the left, your steering wheel will turn to the right and your rear axle will dodge to the right soon after, opposite of the front axle. 9) I would recommend stainless brakelines, adjustable proportioning valve and Hydroboost with this setup. Plus you seem to have no parking brake anymore so consider a Line-loc as well while you are diving into it. 10) The front drive shaft looks to be at a pretty steep angle as well. Consider a CV-style shaft and make sure the slip-spline depth is adequate. I am merely trying to help you create the greatest and safest VX you can have, Sam. I hate so be the one to tell you your builder has A LOT more research and work to do... but I definitely see that as the case. Well said man! I did more picture gazing than reading the first time but your 100% right. If he does have a ton of experience and he's just not using it on your truck, I'd find someone else. And shoot, even with him getting married he should never shove a vehicle out that's not done right. If I'm working on someones ride, I won't let it leave unless it's done right and to my standards, that's your business rep driving out the door. I'd prefer a shop that tells me they need to keep it a few more days because they need to "polish" some things up than just throw it together and get it out. Still excited to see it running and sitting on those big meats but yeah I'd make sure all that stuff was taken care of before I decided to drive it. I'm really surprised he used the stock rear links too. I agree with what Zeus said. Would anyone else be concerned with the amount of oil volume lost from the modified oil pan?? I would have thought a low profile oil pan with side bolsters would have been a better solution. Just seems he lost about 2 quarts work of oil on that pan modification. I didn't look closely at the pics until after reading Zeus's post and have to agree with his obsevations. Hopefully your builder will be able to get all the issues worked out and create a safe beast for you. Keep us updated. Not sure how much research you have done prior to your project but it might be helpfull to do a bit of searching and reading about the issues you are experiencng on the Pirate 4x4 site. There is a lot of good info there. I think that's why Ascinder is using the Vette's "batwing" pan. A dry sump LS7 pan would have been sweet too. Milodon also makes a steel pan but like the batwing pan it becomes wider so I worry about contact with the front diff. I am personally leaning toward the H3 Alpha 5.3 pan for my build as it is 2" or so shorter than the stock truck pan. The trailblazer pan is pretty short there too isn't it? Man, I thought I was anxious to get this thing on the trails! You guys have lots of ideas, but as far as I know, this (and Ascinder's) are the only real projects going on. Not just some bolt on mods over a weekend. This is a build thread that presents many months of development and many more to come. I appreciate all the comments and suggestions, I will keep them in mind - but the tone is not to my liking. This is a work in progress - FAR from done. Perhaps considering that he is a friend of mine would help keep things in better perspective. Like I said, he had to get the VX out of the shop (wedding, reception, honeymoon, etc.) and I had things I could do to it in the meantime (HVAC was top of the list, but all the shops were just too busy). Back up and realize he probably had other things HE was doing while the shop guys worked on my rig. They never said it was done, just to a point where I could drive it and complete some stuff of my own. When I called him with my list, he apologized and was more than willing to bring it back to the front of the line. Obviously there are things that were rushed or incomplete, but I don't remember finding a true builder shop anywhere near here that would touch a driveline transplant. Of those within an hour drive of here said, no way. Further questioning yielded "Jeep bolt on modification shops". Those in more populous states have a greater variety to chose from, not so around here. If you're a professional automotive mechanic, builder or specialist, then good for you and be sure to let me know when you have your own shop and begin to offer nationwide service. I'd be willing to let you work on my rig. That's good to hear! Like I said, I just didn't want to see you get scammed. It's just all too common hearing about people getting screwed by shops so thought I would throw out my 2 cents... didn't mean to step on toes or offend.